KIMBALL TWP. – Andy Thompson has the wiry and tanned look of someone who spends a lot of time outdoors. The Richmond, Virginia, resident will be seeing much of southeast Michigan from the seat of a large tricycle. He and his partner, Ryan Abrahamsen, are creating maps of trails and water routes in the seven-county region, starting with St. Clair County. 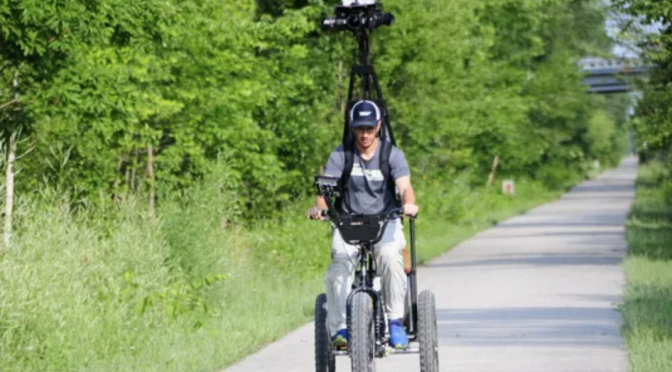 The company, called Terrain360, uses arrays of five cameras mounted on the trike and six cameras on a twin-pontoon watercraft to capture a 360-degree image about every 50 feet. Thompson says it’s like Google Street View for trails and waterways. Tuesday, Abrahamsen and Lori Eschenburg, of the St. Clair County Metropolitan Planning Commission and the creator of the Blueways of St. Clair County website, were mapping the Black River as far up as Windsong County Park as well as part of the Island Loop National Water Trail. Eschenburg said GPS information and the photos will be stitched into an interactive map available on the Terrain360 website. “Fort Gratiot and Port Huron Township can take their sections from the website,” and use it on their own websites, Facebook pages or promotional materials, she said. The effort is through the Southeast Michigan Council of Governments, a seven-county regional planning association. Eschenburg said SEMCOG is footing the bill for the mapping. “It will be all seven counties, but they are starting here in St. Clair County,” she said. Abrahamsen and Thompson will be mapping 116 miles of blueways in the county, including the Lake Huron and St. Clair River shorelines, and 14 miles of trails including the Wadhams-to-Avoca Trail and the Blue Water River Walk. “SEMCOG has a ParkFinder app, and we’re going to integrate this into that app,” Abrahamsen said. Eschenburg said the data will comprise a useful online tool. She said the effort could potentially bring St. Clair County to a wider audience. “People all over the world can be exposed to St. Clair County’s beautiful water and land trails,” Eschenburg said. Thompson said he spent his Tuesday mapping the Clinton River and Paint Creek trails in Oakland County. He was going to do the 12.5 miles of the Wadhams-to-Avoca trail followed by the Blue Water River Walk on Wednesday before tackling the Macomb Orchard Trail through Richmond and Romeo. He said he was looking forward to the Mill Creek Trestle on the Wadhams-to-Avoca Trail, which soars about 60 feet above the stream below. VR is taking viewers deep into the Chesapeake Bay’s infamous ghost fleet. Located in Charles County, The Ghost Fleet of Mallows Bay contains the remains of an emergency fleet of steamships that was commissioned during World War I, but never delivered. The wrecks are now home to natural ecosystems, prompting a nomination for the area to become a National Marine Sanctuary.